I have to admit, my objectives (or objective markers) are really nothing more than functional place holders. I'm actually a bit ashamed I haven't got something a little more substantial to put out on the table when I play. Maybe when I finish my Saim-Hann, I can focus on this slightly deficient aspect of my army. I THINK YOUR MAKERS ARE GREAT. THEY ARE EASY TO MAKE,AND THEY DO THE JOB.FOR GAMERS/MODELERS WHO HAVE MORE MODELS THEN TIME YOU CAN'T GO WRONG.I HOPE YOU WILL MAKE MORE. Grundal: Thanks... they do the job and they're better than showing up with nothing to use. Klaus: I agree, objectives can be a way to let loose a little bit and make something you wouldn't normally get to do. Yeah, the design (the drawing) of your objectives is great. I made objectives for my Tyranids with the chimneys of Genestealers' sprues, in big bases. They were cool and simple! Morkai: Well, all long as you don't claim it be yours... maybe they'll see it and you can credit the appropriate person. I really like your markers, Ron! Simple and easily transportable. I keep meaning to make a few for when I play outside the home. I think I should number the bottom of my objectives just in case we play any missions! 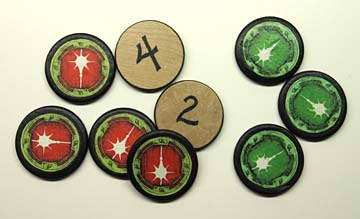 Cawshis Clay: Numbering them on the bottom does just that... if you want to keep something secret or make a specific objective into something without your opponent knowing, numbering them works great. I admit to being a cheapskate, and either use wounded Praetorian models, or if we need a numbered system, I use washers with numbers written on the bottom. I've also used bits of the Macraegge terrain, like the lanterns and power posts glued on bases as objectives. I've actually been wanting to make markers like yours for a while now. When it really comes down to it, yours are infinitely more practical than a mini diorama. Farmpunk: Washers? With numbers on the bottoms... yikes. hey, I have my cheapskate days. I grew up on a farm, where wire and JB weld were the ways to fix stuff.... until you got out the welder. Actually, we don't play many missions where we need numbered objectives. 1" washers (for weighting models) from my kit worked in a pinch. Farmpunk: I'm just kidding, some of the best solutions are the cheapest ones.